A trendsetting Hot Pink Diamond Disc charm from Mi Monedas coin range. This stylish coin is for those who love to keep up to date with fashion! The Mi Moneda coins/discs fit into Mi Monedas complementing pendants to allow you to change your look effortlessly! So pick the size and colour that matches your pendant. Mi Moneda offers unique interchangeable jewellery to match every outfit due to its varying style combinations. When purchasing Mi Moneda, you need to buy the Pendant, Disc/Coin & Necklace to create your individually styled necklace. And don't forget, to choose the correct sizes to fit each! Mi Moneda Jewellery - The luxurious Mi Moneda jewellery brand is inspired by 'vintage coins.' In Egypt, coins were used as 'amulets' that people wore close to their hearts for protection. They perceived the coins to have special meaning and the power to protect from danger or harm. Mi Moneda which translates to 'My Coin' in Spain, have used this as inspiration to create a unique combination of fashionable interchangeable jewellery with spiritual meaning. Mi Monedas fashion forward coins each tell a unique and personal story allowing you to create a stunning personal necklace that has a significant meaning. The collection has grown in popularity and are now adorned by stylist's and celebs all over. So grab yours now! A fashionable sparkling Diamond Disc charm, featuring a stainless steel disc and swarovski crystals. This on-trend coin is from Mi Moneda's Diamond coin range and will instantly glam up your Mi Moneda jewellery. 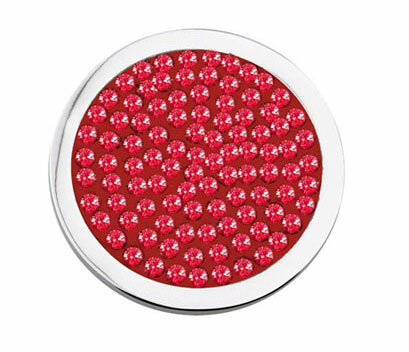 A luxury Infinito small White Coin with gorgeous swarovski crystals on a beautiful Stainless Steel disc. This stunning disc is from Mi Moneda's popular Infinito coin range and will instantly add a touch of glamour to your Mi Moneda pendant. A vibrant mosaic style disc charm from Mi Moneda's new 'Carisma' coin range. This coin will instantly add a chic look to your Mi Moneda pendant.